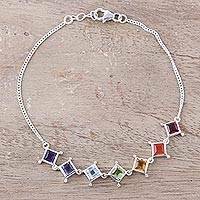 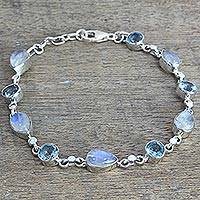 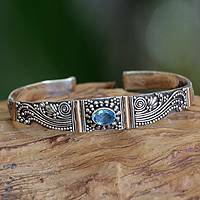 We invite you to celebrate the brilliant cerulean hues featured in both classic and contemporary styles within NOVICA’s collection of blue topaz bracelets. 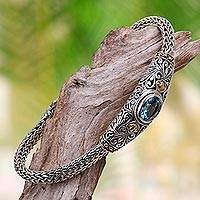 Handcrafted Vermeil Accent Blue Topaz Bracelet from Bali, "Bedugul Temple"
Blue Topaz and Sterling Silver Cuff Bracelet from Bali, "Spiral Temple"
Find an unmatched selection of unique styles featured in NOVICA’s collection of blue topaz bracelets. 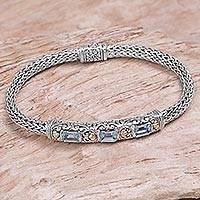 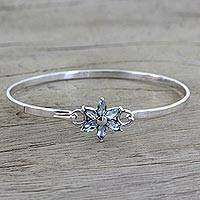 From links to pendants, bangles, cuffs, chains and more, this collection has something for every lover of blue topaz jewelry. 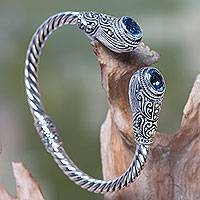 Artisans from the Indonesian islands of Bali and Java utilize the ethereal glow of December’s birthstone and draw from their natural surroundings to create a symphony of blue topaz florets twisting along the curvatures of stunning silver bands. 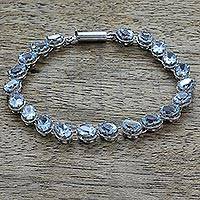 Wear your piece by itself or achieve a more complete look and opt for a matching blue topaz necklace and earring set. 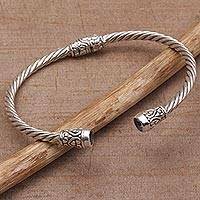 Your purchase includes the story card of the artisan responsible for your newest treasure, which will make wearing it that much more special.